David’s family is deeply saddened to announce his death on April 5, 2019, following a short battle with cancer. He is survived by his beloved wife, Anne from Milngavie, Scotland who he met at Sunday School in 1958. Also surviving are his dear son Iain, daughter-in-law Jaclyn (Stewart), much loved grandchildren Aidan and Fiona and sister-in law Joan Cranmer. David was a native Torontonian from the old village of Swansea, educated at Swansea Public School and Humberside Collegiate. He later received degrees from the University of Toronto and practiced as a professional accountant for many years. Health care delivery was one of his many interests and following a career with the Ontario Ministry of Health he served on two Ontario public hospital boards. A long-time member of the Metropolitan Toronto Police Pipe Band, he remained a strong supporter of the Celtic arts and was a past grand lodge officer A.F. and A.M.
His most memorable quality was his sense of humour – he knew the punch line to every joke, and if he didn’t, he made it up. He always wanted to leave them laughing. 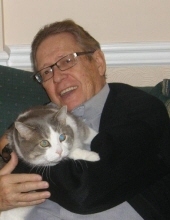 Visitation will be held at KITCHING, STEEPE & LUDWIG FUNERAL HOME, 146 Mill St. N, Waterdown on Wednesday, April 10, 2019 from 7 p.m. – 9 p.m., with a Masonic Service beginning at 7 p.m. and on Friday, April 12, 2019 at HUMBERCREST UNITED CHURCH, 16 Baby Point Rd., Toronto, from 10 a.m., until the time of Memorial Service at 11 a.m. In lieu of flowers please consider a donation to Humbercrest United Church or Carpenter Hospice. "Email Address" would like to share the life celebration of David Gomme. Click on the "link" to go to share a favorite memory or leave a condolence message for the family.